It sounds like it should be trivial: Create a WCF web library and host it in IIS. Surely lots of people need to do this, and it will be easy in a fairly modern version of Visual Studio like 2012? Well, I did not find it easy despite reading a Step-by-Step book (Microsoft Windows Communication Foundation by John Sharp, 2007), lots of blog posts and MSDN articles and so on. Of course, in fairness, the book was quite old compared to my development environment, but in several respects it still seemed quite current. 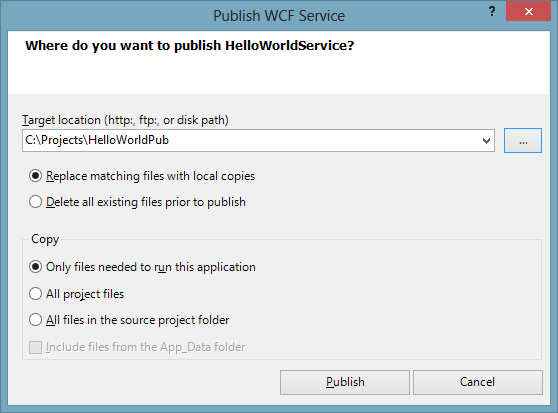 Whatever the reason, I hope this page will offer a useful step-by-step guide to set up a WCF Service Library project to be run from its development folder on Windows 8.0, IIS 8.0 – and I have been using VS 2012 and .Net Framework 4.5 as the target. Also, before I begin, and something of a spoiler alert; you may prefer to publish your website to a specific location, and host it in IIS from there, rather than try and host it from your development folder. This option is covered after the walk-through below. 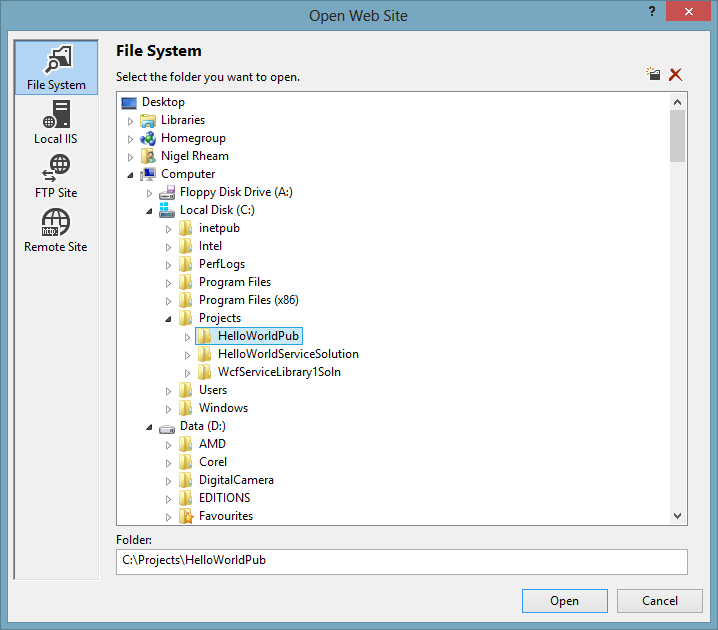 Now, if you definitely want to host the library from its project folder then host the service in IIS we need to follow the next steps. However, you may like to consider Publishing the Website, which has slightly fewer complications at this point! To test the service, open a web-browser and enter the address which is probably http://localhost/HelloWorldService/HelloWorld.svc You should see a page which starts with a heading and then the text ‘You have created a service.’. If you add ?wsdl to the URL, you should get a load of XML on the screen which is a description of the service. 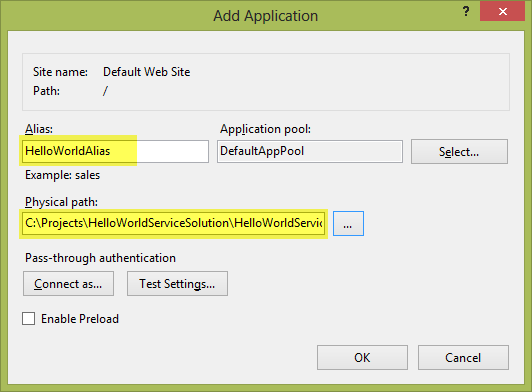 I chose to create a project with the name ‘HelloWorldService’ and the solution folder with the name ‘HelloWorldSolution’ – I’m not normally in the habit of naming my solutions like this, but I didn’t want to have five different things named the same thing which can get pretty unclear while you are learning! Now we can test everything works together properly by pressing F5 – or the Start button. 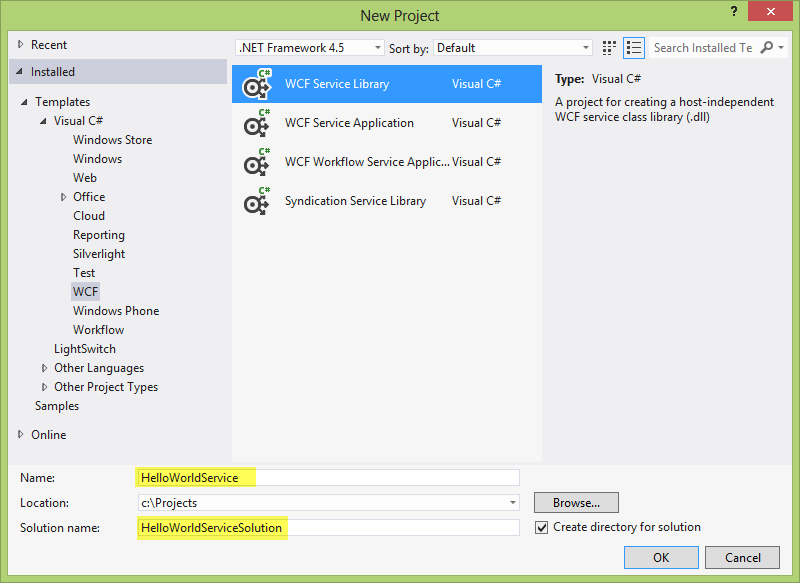 The WCF Test Client window should pop up, and after a short time you should see your service under the My Service Projects node. If this has all worked ok, you should have some confidence that the solution is basically working correctly. 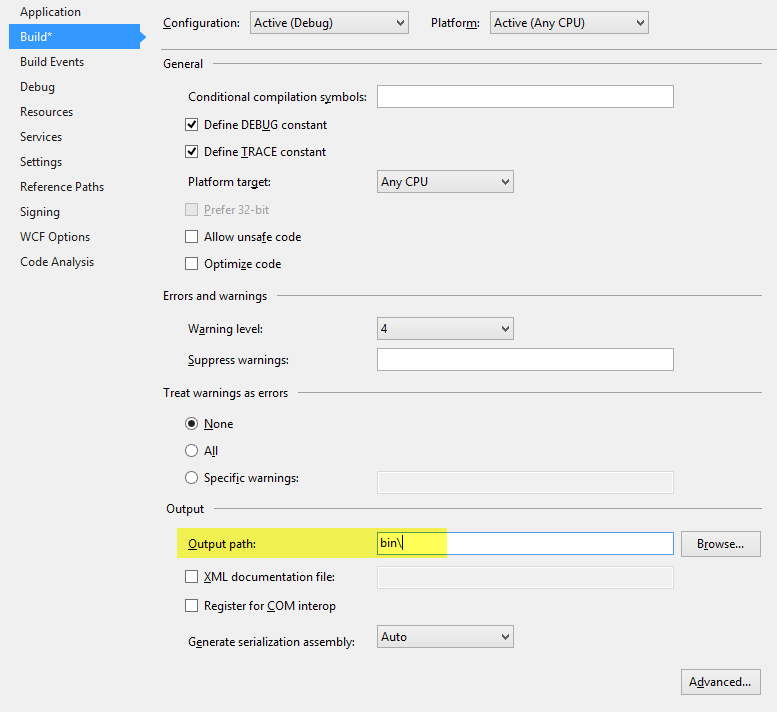 These steps are only necessary if you don’t want to Publish the Service instead (see below). 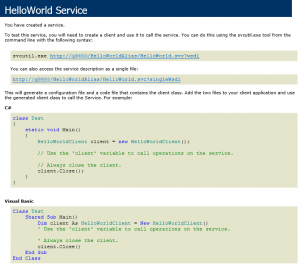 The type ‘HelloWorldService.HelloWorld’, provided as the Service attribute value in the ServiceHost directive, or provided in the configuration element system.serviceModel/serviceHostingEnvironment/serviceActivations could not be found. If you now rebuild the project and refresh your browser view, you should clear the ‘could not be found’ error noted above, and the system will now show a page stating that ‘Metadata publishing for this service is currently disabled‘. To be honest, I had expected to have to address an issues with folder permissions on the project’s directory at this point, but as it happens I did not have to when doing this walk-through. It seems likely that I learnt incorrect information while trying to solve my previous problem… but refer to the heading ‘Which User Runs my Site Anyway?’ for a bit more information in this area. 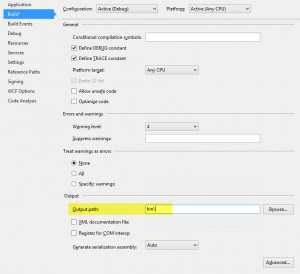 Isn’t Duplicating Configuration Bad Practice? Isn’t duplicating the App.config file in Web.config bad practice? Probably. There are some options hinted at here that might reduce the duplication, but this whole walk-through came about because of the book I had that suggested it.. and this, I am sure, was at least partly driven by a desire not to add additional projects to a busy solution if that could be avoided. However, one possibility that became available is to Publish your project to a specific folder, covered next. When you click the Publish button, the necessary files will be copied to the new location, and this actually includes the binaries and it renames the app.config into Web.config! 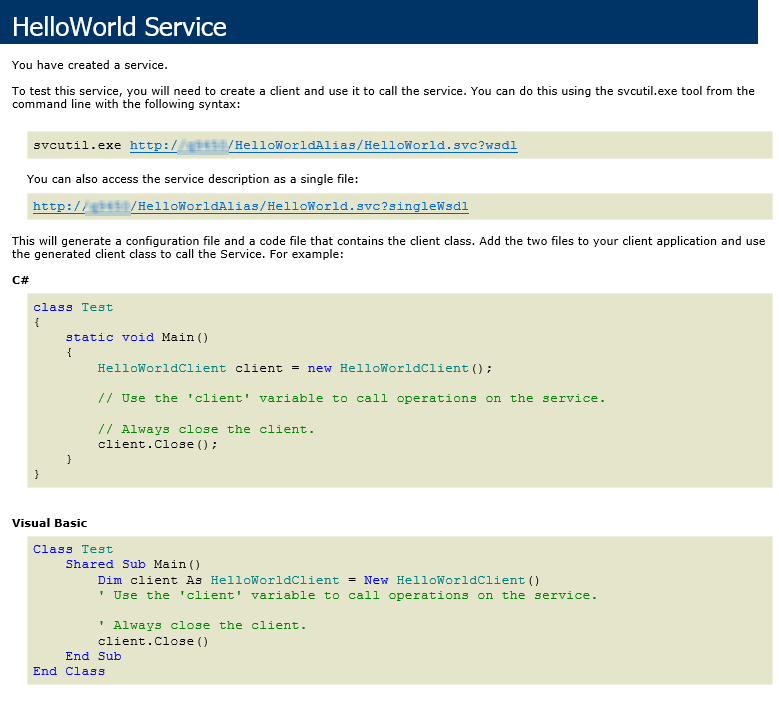 You may also note that this process creates a svc file for you – it faithfully copies the one we created called HellowWorld.svc, but it also creates one for us as HelloWorldService.HelloWorld.svc! This process shows us that the publish tool can create a svc fie for us if we didn’t do it (with a slightly longer name), and also maps that App.config to a Web.config. 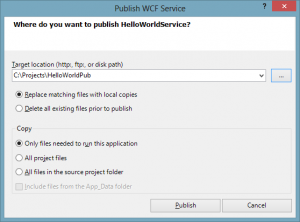 At this stage, you now have two methods which will hopefully help you to host a WCF Library project using IIS. You haven’t even built a client to the service yet! Speaking for myself, I was happy with the built-in WCF hosting that you get by default with these projects, until I started trying to implement Inversion of Control following a book by Mark Seeman. Without getting into too many details, that is not possible without some fairly complex additions to a WCF project that can not be hosted by the tools integrated with Visual Studio. At this point, my slight preference will be towards publising the project to avoid having to write a svc file myself, and duplicate the App.config file. However, either implementation may have issues that I am yet to discover, such as issues while debugging perhaps? Why is Web.config So Important? 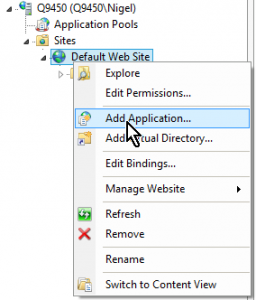 So essentially, when this library is being hosted by IIS, IIS needs a Web.config… and if we had hosted it elsewhere (perhaps in our own process) we would have needed to duplicate configuration data to that application’s configuration file. Which User Runs my Site Anyway? 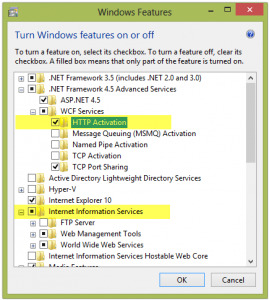 When you research IIS security (especially if you have a past that includes work with ASP.Net websites, you will probably have heard of the NETWORK SERVICE account… but that information is outdated as at IIS8.0 (and I believe this changed at IIS 7 or 7.5). Now, the default identity that an application pool runs under is something called ‘ApplicationPoolIdentity’. This is not a windows user, but it actually maps to a distinct user per application pool. Thus, the DefaultAppPool, when set to run with identity ApplicationPoolIdentity will actually be run with a principal ‘IIS APPPOOL\DefaultAppPool’ and if you set up a pool of your own such as ‘HelloPool’ then the user will be ‘IIS APPPOOL\HelloPool’. This is at least sort-of a virtual user (this is vague terminology but I am learning as I type) – but they seem to be part of a new group called IIS_IUSRS if I understand this link correctly. 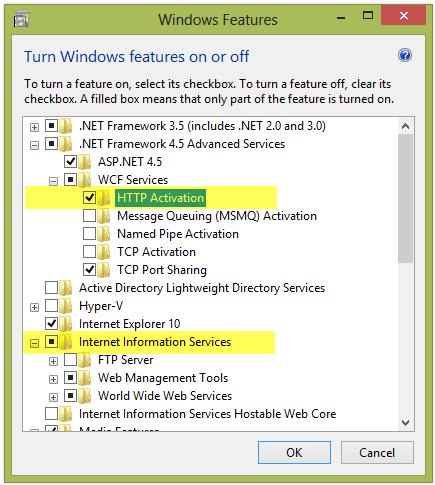 This link is also useful, though both are a little old I think they are current (enough) for IIS 8.0. 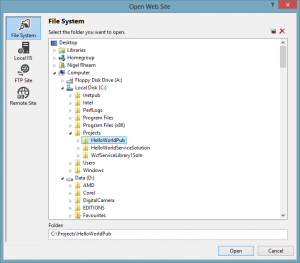 Many of the examples and guides I saw when first figuring this out suggested that I give NETWORK SERVICE user and IIS_IUSRS group ‘Read & execute’, ‘List folder contents’ and ‘Read’ permissions on the project folder. As it happened, it seems I did not need to do this for the walk-through above, as apparently the site was getting permissions through some other means. This entry was posted in .Net Details. Bookmark the permalink. It works as a charm! thanks you, I really appreciate your effort, it really save my lot of time. The life saver was the HTTP Activation under .Net 4.5, added it to my server and all was good.